WASHINGTON, D.C. – Master Your Card, a community empowerment program sponsored by Mastercard®, today joined representatives from the Bronx Borough president’s office and local educators to recognize more than 250 students who completed its interactive financial education program at the Bronx School for Tourism and Hospitality, and New Visions School for Advanced Math and Science II. Today’s event also featured a panel discussion, an interactive game and other activities for students. Master Your Card partnered with EverFi, Inc., the nation’s leading education technology company, to bring this financial education program to students at no cost to schools or taxpayers. The program is part of a community initiative aimed at providing financial education to students in financially underserved communities. Available to schools in the Bronx, the program uses the latest in simulation and gaming technologies to bring financial concepts to life for today’s digital generation. Administered by teachers in the classroom, the high school curriculum aligns with both state and national standards, and covers a range of critical financial topics such as saving, budgeting, credit, debt, careers and income. 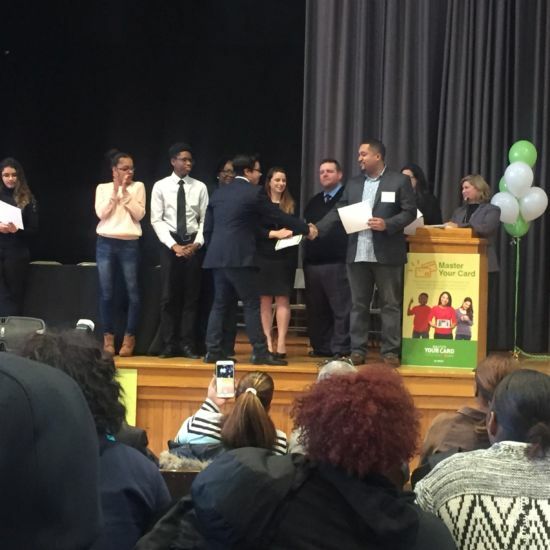 In addition to the Bronx, Master Your Card is working with grade and high schools in Baltimore, Md., Southeast Los Angeles, the Mississippi Delta and Richmond, Va.
Master Your Card Senior Advisor Shawn Miles presents students with their certificates.